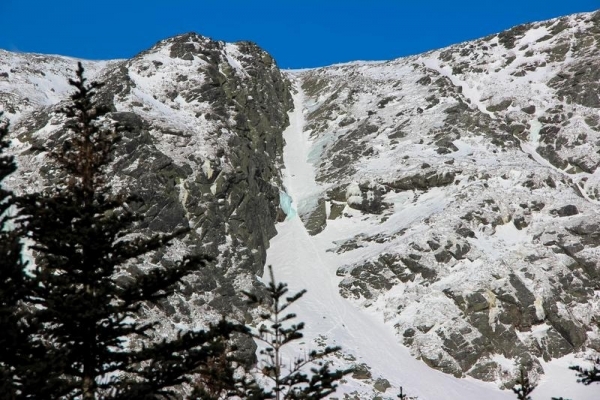 As winter turns rapidly to spring, a number of hazards become prevalent in the steep terrain of the Presidential Range and particularly the Headwall of Tuckerman Ravine. Waterfall holes, glide cracks or crevasses, moats around cliffs and rocks, and other deep holes open as the thick snowpack melts. A fall into these holes, which often also have significant amounts of cold flowing water which can quickly cause hypothermia, can be very difficult to escape or be rescued from. Such accidents have resulted in several fatalities in Tuckerman Ravine. A lucky skier had a very close call in this type of accident yesterday. At 1:58 PM on Monday, April 22, a skier fell over the Tuckerman Ravine headwall and into one of several waterfall holes. Partners and bystanders quickly initiated rescue efforts and also called 911 for emergency response. Unsure of where under the snow the fallen skier was, a beacon search was initiated and could have been helpful, though this was a non-avalanche accident. At 2:18 pm, after 20 minutes out of view to the rescuers, the subject climbed out of a different hole in the snow and slid down to the rescue party below him in the slope. He had lost his skis, poles, and pack. The subject was alert, oriented, and able to walk but in pain from several impacts during the fall. He was also cold and wet from spending most of the 20 minutes in very cold flowing water, though not submerged. The rescue party quickly changed his clothes to drier ones. They wrapped him in a sleeping bag and briefly transported him in a rescue litter obtained from the nearby Connection Cache of emergency supplies. In effort to warm the subject, the rescue party then helped the subject begin walking down the Tuckerman Ravine Trail towards Hermit Lake. The fall line glissade track just right of center leads up to waterfall hole and accident site, with partners of the subject shown helping him walk downhill. Meanwhile, U.S. Forest Service Snow Rangers were notified of the incident by emergency dispatchers. They travelled to Hermit Lake with urgency, aware than similar accidents have historically been fatal. Upon arriving at Hermit Lake, Snow Rangers were told by the AMC caretaker that the subject had extracted himself from the waterfall hole and was walking, with aid, down to Hermit Lake. They proceeded up the trail, meeting the rescue party at 3:20 PM. The subject, still alert and oriented but now warmer, was transported to Pinkham Notch via snowcat and released to the care of friends. This positive outcome should be regarded as quite lucky and be taken as a warning for all who travel on steep snow slopes in spring conditions in our mountains. Had the subject, who was a strong athlete and also a climber, been unable to self-extricate himself from the waterfall hole the outcome could have been far worse. Many of these deep holes in the snow are impossible for even the strongest individual to climb out of. Extricating a person from these holes can be very dangerous for rescuers and is difficult to accomplish in a sufficiently timely manner to save a life. We know the subject would urge you to learn from this accident, giving potentially deep holes and glide cracks in the snow a wide berth and taking care to not fall above one. The rescue initiated by partners and bystanders of the subject was a positive example we would also like you to learn from. Partners were paying attention to each other and able to quickly initiate a rescue. They had sufficient dry clothing and emergency supplies to provide proper care for the subject. Several emergency medical professionals observed the accident and immediately helped rescue efforts. Rescuers had knowledge that a litter and hypothermia wrap materials were available in nearby Connection Cache and used them. All individuals on the scene had avalanche rescue gear, as large wet slab avalanches were forecast as unlikely but not impossible that day. While a call was made for professional rescue, this group realized that they could provide timely aid to the subject and took appropriate action that could have resulted in an effective evacuation had professional rescue been delayed or unavailable. This self-reliant level of accident response is commendable. It is also the level of response that everyone travelling in the backcountry should be prepared for, every time you’re out. Please learn from this accident to have a safer spring ski season, and see you on the hill! 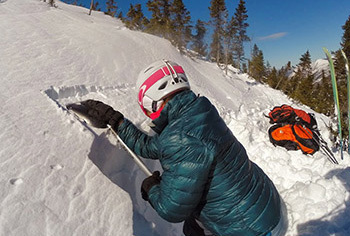 On Sunday, February 10, 2019 at 4:45 p.m. U.S. Forest Service Snow Rangers from the Mount Washington Avalanche Center responded to a report of an overdue climber. Local volunteer search and rescue teams assembled with Snow Rangers to search the terrain above Huntington Ravine and below the climbers intended route. The climber was attempting to climb a moderately difficult snow and ice climb called Central Gully. Icy surface conditions that developed in the mountains following several days of warm temperatures and rain increased the danger of long sliding falls the day of the accident. 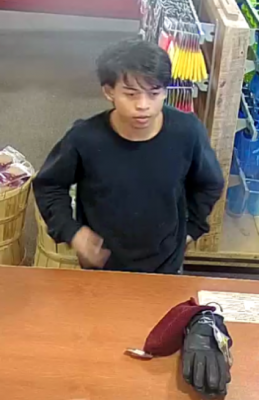 The body was found at approximately 7:45 p.m., recovered from the mountain, and released to local authorities that night. The incident is currently under investigation with law enforcement. 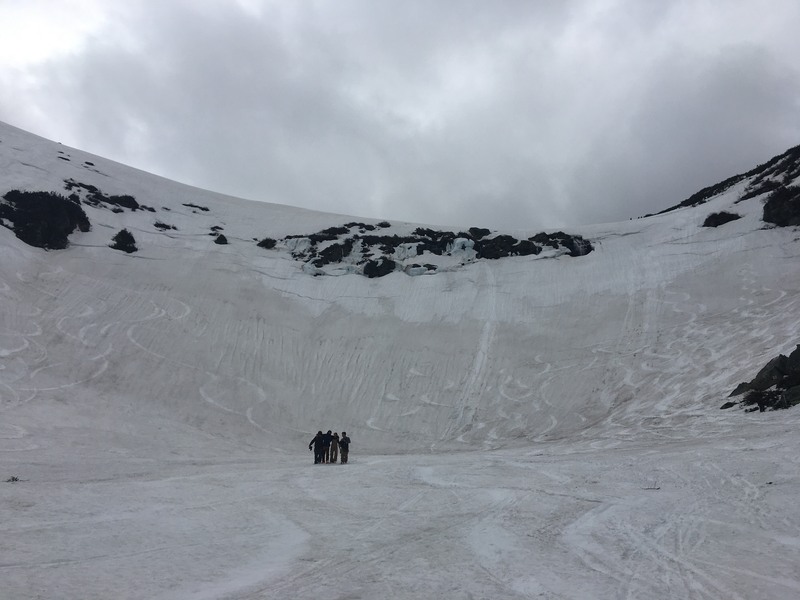 When it is appropriate to do so, the Mount Washington Avalanche Center will release an incident report as a public safety and educational tool designed to inform the recreating public of any lessons learned. 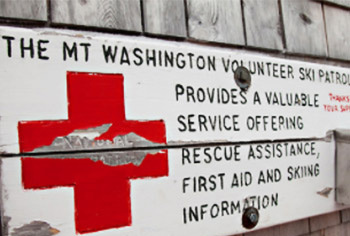 The U.S. Forest Service operates the Mount Washington Avalanche Center (MWAC). MWAC issues daily avalanche forecasts and assumes search and rescue responsibilities from the State of New Hampshire for the Cutler River Drainage annually between December 1st and May 31st. In addition to identifying probability of encountering snow avalanches, the forecast contains mountain safety information to help guide Forest visitor decision-making when entering the backcountry. For media inquiries regarding this incident, please contact Evan Burks, White Mountain National Forest Public Affairs Officer at 603-536-6215. Got a Mount Washington or Presidential Range tale to tell. Contact Sean at NHPR. As those who attended ESAW and recent MWAC outreach events have heard, our forecast zones are changing this year. The primary drivers of this change are changing use patterns, a desire to be consist with the use of North American avalanche danger scale (and other forecast center messaging), and a desire to provide information to folks venturing into other aspects and elevations around the area. Beginning this year, we will provide an avalanche forecast for most of the Presidential Range, shown on the map below. Along with an overall expansion, we have reduced the number of forecast zones in Huntington and Tuckerman Ravine from eighteen to seven to more accurately use the North American danger scale in the forecast. Additionally, our goal is to have our forecast available online by 7am every day. We will also be rolling out some graphical products to help our readers retain the information, as well as to clarify the written narrative found in our text. It’s important for you to realize, and to help spread the word, that expanding our forecast zone requires that we move away from micro-scale forecasting. Slope scale forecasting has been the historic norm here and has some advantages but also has a tendency to remove some of the decision making burden from the climber or skier. Rather than providing a danger rating for each gully, we will provide information to help you identify the avalanche problem type wherever it is found in our forecast zones. This will allow you to align your mitigation strategy to the terrain and the character of the avalanche (or long sliding fall as is, unfortunately, often the case). We will continue to provide an assessment of the size and distribution of the problem as accurately as possible and strive to effectively communicate our degree of uncertainty in our forecast. Now more than ever, you will need to perform your own assessments in the field to determine the size and distribution of the avalanche problem. An earlier forecast means a more weather-based avalanche forecast. We will no longer be able to make field observations just before final decisions are made on the danger ratings. We will rely on the previous day’s observations, made either by us or by the public, combined with the usual weather products. Posting the advisory at 7am means that we will not be able to fine tune our forecast assumptions by looking at the terrain. This is nothing new for us since poor visibility often robs us of this opportunity. 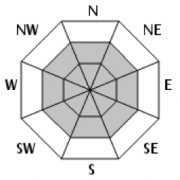 Essentially, you will need to use our forecast as a starting point for your own field observations when you travel into the terrain. Forecasting for the range means that we may be slower to respond to a call for rescue. There is no guarantee that we can save a life even if we are in position at Hermit Lake or nearby in Huntington and ready to respond to a call. Asphyxiation in an avalanche burial is likely to occur within 20 minutes of burial. An avalanche death by trauma or by asphyxiation has roughly even odds. Our best tool to help people survive and thrive in avalanche terrain is to provide information and encourage safe travel. We hope that an earlier advisory, covering more areas which are seeing more use and more incidents will assist in better decision making. In the past year, 96,430 people read our advisory on a personal computer, phone or tablet (compared to 17,000 users 10 years ago). Last year, around 48,400 people used their phones to read the advisory 118,000 times. We still post a printed, paper copy of our advisory in several places on the mountain, but very near to where we post it on the avalanche information kiosks (or slatboards as we call them), cell phone signals are strong enough for a dawn patroller or winter camper to pull up the advisory. While we intend to continue printing out a paper copy of the advisory, at least for another year, the practice doesn’t seem to make sense in the long term. Usually one of us, especially on weekends and holidays, will still be in the Cutler River Drainage, and at the Harvard Cabin, for face to face conversations. Wave us down and we’ll be happy help you find the right slope or climb that suits the weather and snow conditions. Avalanche forecasters don’t visit every area they forecast! It just isn’t practical to visit every location in any range in the country that has avalanche forecasts. Workloads and available daylight won’t allow the trip to those low use areas which are probably seldom visited for good reasons. Our field days will likely follow hot spots of use. Though some places will rarely be visited by a forecaster, our forecast should still be helpful to you as you look for avalanche problems. Identifying patterns is part of process and keeping up with snow and weather history and the day’s forecast can help you stay out of trouble and hopefully find the goods. Observations – Tag us in your Instagram videos with snow and avalanche observations, send us an email or find us on Facebook. Your observations don’t have to be pro level, but a video goes a long way toward giving us some context to your observation. What did you find on the surface? Did you dig? Perform some stability tests? Did you get results but ski the slope anyway? Did you fall into an ice dam? All of these are great for us to pass along so take a minute and share your info. We’ll be creating a new tool on our website to make the process easier and to make your post public soon. Support – Your time or money will expand our capacity. Last year, we asked for help with a power inverter and battery setup at the cabin and several folks hooked us up and accomplished in a few days what would have taken us weeks. At my talk last week in Portland, 20 people won some stuff, learned a couple things and ponied up four hundred bucks to Friends of Tuckerman Ravine to support our mission. We’ll need that kind of support and more in the future. We have plans for remote weather stations at several locations and we’ll be looking for support to buy and install them. Stay tuned for opportunities and don’t be surprised if you see an online beg-a-thon, auction item, or Gofundme campaign for remote weather stations in the near future. There are many pros and cons to the move but in balance, we think that the public will be better served by the new approach. 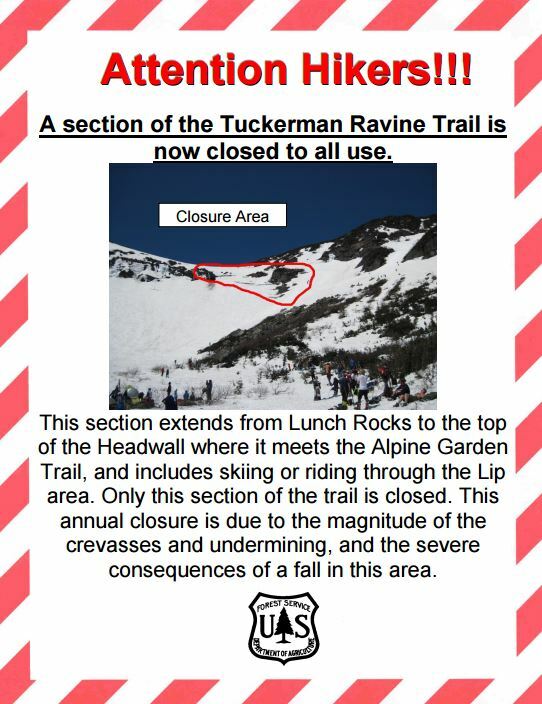 The exception to the new plan will be the annual migration of skiers hiking to Tuckerman Ravine in the early spring. At that point in the season, we will circle our wagons at Hermit Lake and do what we can to provide for a safe experience for that crowd. This will likely mean a return to the slat board to communicate the simplest safety messages. It will also mean a continued campaign to talk people out of sitting under teetering frozen waterfalls. This spring, you may also see one of us in the Gulf of Slides, the Ammo, or Oakes Gulf serving a different crowd. And you may see us training in Crawford Notch State Park when it is just too darned cold to climb in Huntington Ravine! As we move into the season, look for these changes and give us your feedback. We will be looking for examples of what works and what doesn’t with our new products and approach. Fellow avalanche forecaster Julie Leblanc comes to us from north of the border and Avalanche Quebec. Serving the Chic-Choc Mountains of Quebec’s Gaspe Peninsula, Avalanche Quebec is the only avalanche center in eastern Canada. For those counting, that makes two in eastern North America when combined with the Mount Washington Avalanche Center. 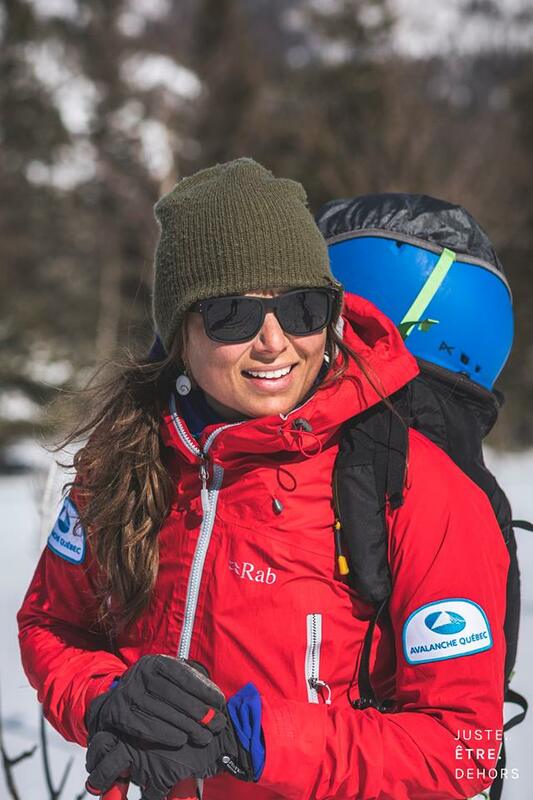 Julie brings a wealth of knowledge to the Eastern Snow and Avalanche Workshop as a veteran avalanche professional in the region. She will be both a presenter and member of our discussion panel. We’ll see you at ESAW this Saturday, November 3rd, to learn from Julie! We’re happy to introduce Dr. Elizabeth Burakowski, coming to ESAW from the University of New Hampshire’s Earth Systems Research Center and Institute for the study of Earth, Oceans, and Space. She will enlighten us on one of her primary projects, Citizen Science Snow Observations. Dr. Burakowski is a climate scientist who uses climate modeling, remote sensing, and ground observations to investigate the interactions among land cover, land use, climate, and society. Accordingly, Liz will also help us understand regional impacts of climate change. 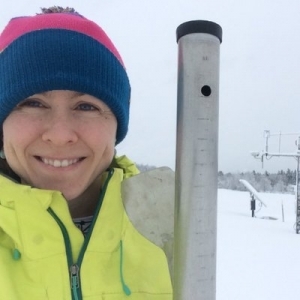 An avid snow sports enthusiast herself, another of her research interests is the effect of warmer winters on winter tourism and the ski industry. We hope you’re as excited as we are to learn from Liz this Saturday at the Eastern Snow and Avalanche Workshop! 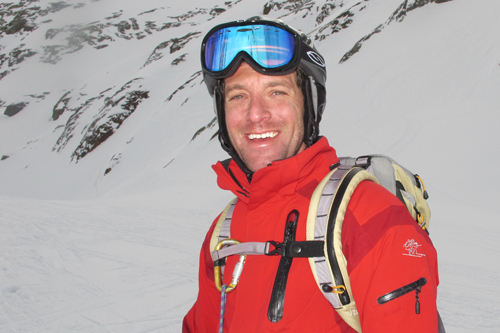 From nearby Lyme, NH, we are pleased to welcome Sam Colbeck back to the Eastern Snow and Avalanche Workshop. 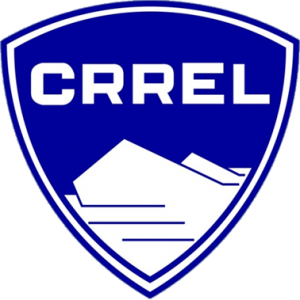 Sam is an Emeritus Researcher and former Senior Research Scientist at the U.S. Army Corps of Engineers Cold Regions Research and Engineering Laboratory (CRREL) in Hanover NH. With the metamorphosis of fallen snow as a primary research interest through his career, he contributed pioneering advancements to our understanding of how snow grains change over time. In 2000, the American Avalanche Association named Sam an Honorary Member, their highest award. 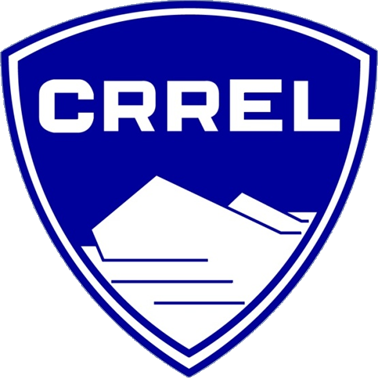 His work as a true snow scientist includes but also extends beyond our world of avalanches, with research influencing all things snow, from military operations and nuclear power plants to ski racing. The Ragged Mountain ski patroller and avid skier will surely lead the charge to awaken your snow brain on November 3rd. We are pleased to introduce Brian Lazar, the Deputy Director of the Colorado Avalanche Information Center since 2010. Brian has been working in the field of snow and avalanches for the last couple decades. He began backcountry skiing in Colorado as a college student, soon becoming a mountain guide and avalanche course instructor. After a decade or so of guiding and teaching in a variety of snow climates on both sides of the equator, Brian returned to graduate school where he earned a MS in Engineering, studying snow and ice mechanics in Alaska’s Chugach range, and conducting research at the Institute of Arctic and Alpine Research. He worked for many years as a consultant to the ski industry, investigating snowpack runoff and potential changes to seasonal snowpacks as a result of climate change. Annual spring snow melt creates significant glide cracks, or crevasses, and undermined snow in the Lip area of Tuckerman Ravine. We close a section of the Tuckerman Ravine Trail where it passes through the Lip as a safety measure. This relatively short section stretches from Lunch Rocks in the Ravine to the junction with the Alpine Garden Trail just above the Ravine. Ascending or descending through this area now has numerous hazards which greatly elevate risk to travelers. The closure also pertains to skiers and riders. 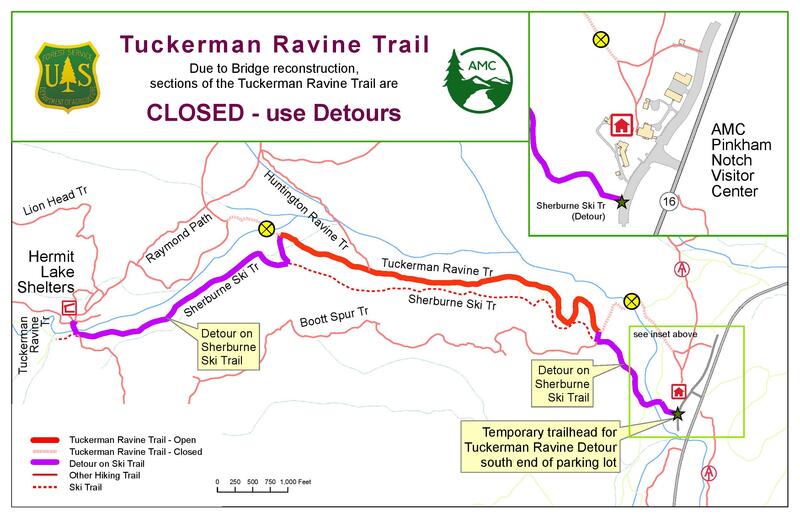 The closure only pertains to this section of the Tuckerman Ravine Trail and will remain in effect until melt out eliminates these specific hazards. Hiking this time of year can be especially challenging as warm temperatures make shorts and lightweight hikers more comfortable than soft shell pants and mountaineering boots. Trails can change from knee deep rotten snow to bullet-proof ice is a matter minutes in cool temperatures and shade. Currently, the Lion Head summer trail and winter route are equally challenging but for different reasons. The Summer route has stretches of ice remaining and a long traverse through a snowfield at tree-line that has been the seen of some pretty bad falls. The winter route is generally steeper and the steepest section now is exposed rock and frozen mud. While never technically closed, the summer route is exposed to significant avalanche hazard and only becomes the recommended route to the summit from the east side of the mountain when avalanche hazard subsides. We have reached the point in time when the summer route becomes a good alternative. That said, there is still ice along with that steep and potentially icy slope near treeline. Be prepared and equipped for icy conditions on the summer trail when it’s cold at that elevation, along with rotten and deep snow as it warms up. The Tuckerman Ravine trail through Tuckerman Ravine is nearing the point where a closure makes sense. If you plan to ski the Lip, understand that the waterfall holes are open below you and create the potential for a fatal fall into a 70′ deep or more hole. Fryeburg Academy’s Leura Hill Eastman Performing Arts Center presents the MountainFilm Festival on Thursday, May 3rd at 7:00 pm. MountainFilm is an annual documentary film festival that showcases nonfiction stories about environmental, cultural, climbing, political and social justice issues that matter. Along with exceptional documentaries, the festival goes beyond the film medium by bringing together world-class athletes, change makers, and visionary artists for a multi-dimensional celebration of worthy causes. See the trailer here. Fryeburg Academy is situated 10 minutes from North Conway, NH in the foothills of the Mt. Washington Valley and surrounded by people that value outdoor recreation, environmental stewardship, and sustainable development. We hope that this event will become an annual evening of fun that brings people together to celebrate indomitable spirit. 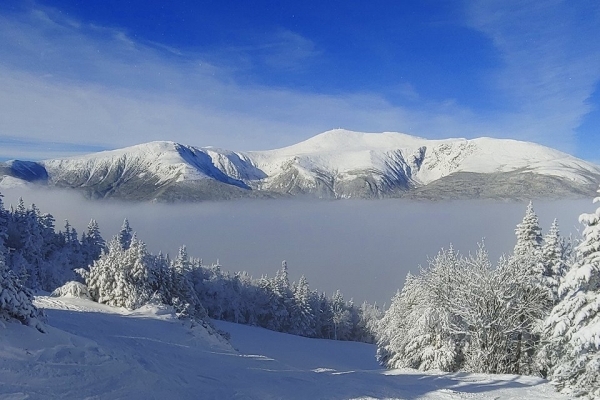 Representatives from local outdoor recreation organizations, including the Mount Washington Avalanche Center and the Granite Backcountry Alliance, will be set up in the lobby to answer questions and provide information about their operations. All proceeds from the event will support outdoor programs at FA. For more information visit www.mountainfilm.org.